Sesame seeds are the first recorded seasoning in history. The are produced from the sesame plant and are grown in many countries. Sesame seeds are all tiny and flat, but may be red, brown, yellow or black in color. The black seeds are the most flavorful and aromatic, but all have a rich, nutty flavor which is released when toasted. Sesame seeds are very popular in Chinese cooking. They are also the primary ingredient in hummus, a Middle Eastern dip. In addition, sesame seeds are often used to top of breads, cookies, cakes and other baked goods. Sesame seeds have a very high oil content, so take care when storing them. Keep in an airtight container in a cool, dry place for up to three months or refrigerate them for up to 6 months. Lightly toasting sesame seeds in a dry pan brings out a lovely color, a rich flavor, and the natural oils for a pretty gloss. 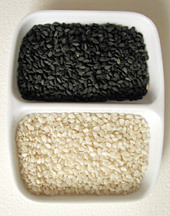 Black sesame seeds are equally attractive and tasty when toasted. This entry was posted on Saturday, November 3rd, 2007 at 6:57 am	and is filed under Encylopedia, Herbs & Spices. You can follow any responses to this entry through the RSS 2.0 feed. You can leave a response, or trackback from your own site.